A symbol of abundance, immortality and wisdom, a pitcher plays an important in every religious ritual. It signifies mother earth and is believed to contain the elixir of life. Get this beautifully crafted metal pitcher to start your holly prayers. Gold plated this exquisite symbol of almighty is carefully hand painted to enhance the beauty and grace. 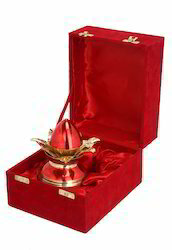 Additionally, the lotus shaped stand and coconut shaped top lid makes it a perfect representative of deity. "Wow! What an imperial way to enjoy fine dining or a crispy brunch. This twin swan-head decorative bowl is artistically carved from brass metal and finished with pure silver polish for desired shine. Secured velvet box packing make this plate and spoon set an instant gift for a loved one. 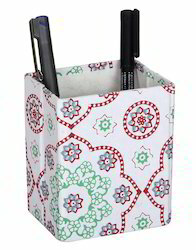 Impress everyone at work carrying this beautiful file folder with gorgeous lace work. Made in jute and polydupion, it is durable and handy. 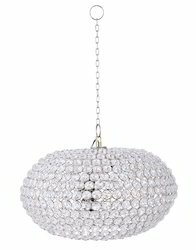 Add some luminance to your home by placing this natural colored Chandelier Glass lamp. Architectured with antique glass crystal and accentuated with metal designs, this designer pattern is carefully crafted with hands and comes in a wide variety of styles.Decorate your room with this crystal bedside lamp creating an ultra-modern style that complements numerous interiors. Give an attractive handmade packing to the classic bottle of wine. 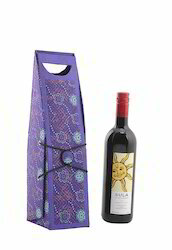 This wine bag is made of cardboard from inside and has beautiful floral printed handmade paper covering outside. The handmade paper wine bags is lightweight and doesn't make the entire packing heavy. The plastic holder's attachment makes it easy to pick and carry the bottle wherever you want. Use the foldable wine bottle holder to gift wine to your friends or guests on the special occasions. The unique wine bottle holder can be utilized as a gift alone. 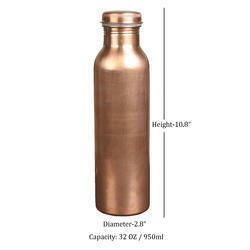 Use it to pack your wine for an outing or a picnic. 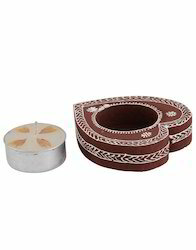 With Through Knowledge Of Changing Trends Of The Market, We Have Been Able To Bring An Exotic Range Of Wooden Carving Gemstone Painting Tea Coaster Set With Brass Work. Our Offered Products Are Manufactured Using High-Grade Quality Wood. Made Using Premium Quality Material. 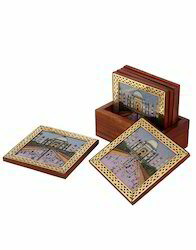 These Decorative Tea Coaster Are Crafted Diligently And Passionately. Each Item In This Range Is A Perfect Reflection Of Creativity And Excellence In Wooden Work. 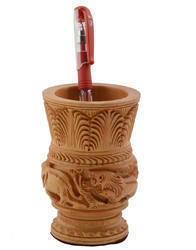 Exclusively Used For Gifting Purpose In Wedding, Anniversary And All Occasions Or For Home Decoration As A Show Piece. These Beautiful Piece That Will Add A Charming Touch To Any Home. Rajrang presents the wooden serving tray made by wooden product.This tray is the perfect way to serve all sorts of dips and chutneys or snacks, and also use as rajshahi party time. Rajrang presents the decorative serving tray made by wooden product.This tray is the perfect way to serve all sorts of dips and chutneys or snacks, and also use as rajshahi party time. 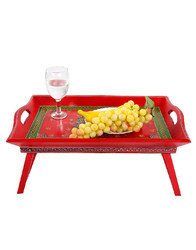 Rajrang presents This Elegant Wood Bed Tray Is Sturdy In Construction And Elegant In Color And Style. Made Of Wooden And Lightweight, Easy To Clean Up, Carved Handles For Easy Carrying, Easily Folded For Storage, It Is Multi functional And Can Be Used As Serving Tray, Tea Tray, Fruit Tray, Cup Tray, Laptop Desk. With Fold able Legs, Carrying Handles For Easy Carrying Indoor&Outdoor And Can Be Used In Many Places, Like Home, Patio, Hospital, Open Air For A Picnic Etc. 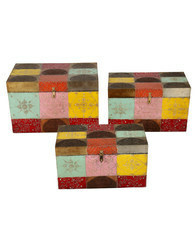 Preserve your valuables in this vintage looking wooden box from Rajrang. The lid of the box is removable to have complete access to the items stored inside. This way it is also easy to clean the box regularly. This lid has Hand Work design that gives you a reflection of the Moghul art which makes it an attractive decorative piece as well. The raw and the rustic finish of the box makes it beautiful. You can use this wooden box as a decorative piece or an organizer.This multipurpose box can be kept on your dressing table to store your jewelry, tie, cufflinks, coins and anything small that comes with your daily utility. To maintain the luster and charm of the box use a soft and dry cloth to clean it. Features Give a decorative touch to dresser, drawers, cabinets, doors and more with these ceramic knob set. 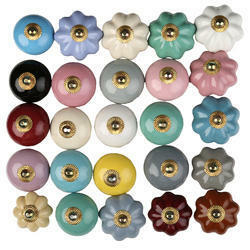 A beautiful mixed set of 25 ceramic knobs. These knobs have been handpicked to compliment one another. Create a unique look to enhance your room. Easy to install and comes with fixing nuts and screws. doors and more with these ceramic knob set. Description :Rustic in its charm, the leather journal is a perfect companion for the storyteller in you. Designed with love and bound with skills this diary serves for all, use it as a daily journal, Planner, sketch pad or even as a scrapbook. unleash the inner writer, painter and artist in you and carry our leather journal to everywhere you travel. The size of the journal makes it easy to carry around, so just slip it in your satchel or your tote and rove around. The amazing smell of the buffalo leather with stitched leather edge design will provide you with the perfect vintage feel while the wrap around cord will keep your journal closed and will also act as an instant bookmark. You can even gift it to your loved ones and make them feel like some Shakespeare of Renaissance. "Our nested steel mixing bowls are made in such way that it will serve both of your bigger and smaller requirements. Whether you want to use them for beating and whisking or for marinating and storing, these bowls serve for all. They are deep enough for tossing your salad and the nested arrangement makes it really space saver and easy to store. Being commercial kitchen grade these bowls are dishwasher, refrigerator and freezer safe. Wide rims make them really handy and easy to grip, thus making pouring and transferring less messy and dirty. The raised base keeps the bowl in place while tossing or whisking. They are rustproof and have a Non- Stick surface. They are also sturdy, shiny and perfect for your gifting purposes. 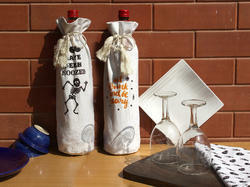 "Rajrang 100% Cotton canvas Halloween Wine Bags are Festive and durable. These bags are machine washable for easy care. The Halloween design bags coordinate with any kitchen décor. Cotton canvas gift bags are strongly woven in high quality, providing you with the right accessory to pack your gifts. These bags are reusable, giving you confidence in your purchase. "Rajrang offer you a very unique and specially designed handmade decorative lighting product for home, retail stores, and luxury hotels. 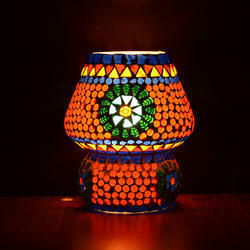 These Mosaic lamps are made of original colour glasses. When the lamp is lit, the glasses appear in colourful shades, which will effortlessly change the ambience of your room in a beautiful way. 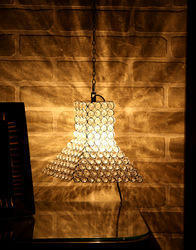 The Handmade Lamp is great for mood or accent lighting and adds an awesome feel to the room. It comes with electric wire which is attached to a clip switch that makes it very easy to turn it on and off. Add a regal touch to your dining with this embossed silver plated brass metal bowl. Highlighting the fine and intricate detailing, this serving bowl reminds of the exotic vintage art. A beautiful surprise for a loved one, this silver polished bowl will definitely be an exclusive choice for home decor. These are admired for their unique designs and appealing look. 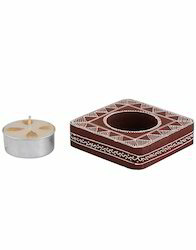 Based on eye-catching themes, these candle holder are exclusive and attractive. 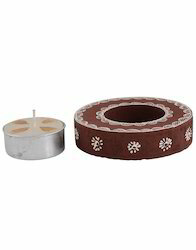 Our Wooden candle holder are acclaimed for their maximum durability and elegance. The offered products are excellent examples of the creativity of skilled artisans and are highly acknowledged due to their smooth finish and attractive look. Made using premium quality material. Exclusively used for gifting purpose in wedding, anniversary and all occasions or for home decoration as a show piece. "Add some luminance to your home by placing this natural colored table lamp. Architectured with antique glass crystal and accentuated with metal designs, this designer pattern is carefully crafted with hands and has come with an Eiffel Tower pattern. 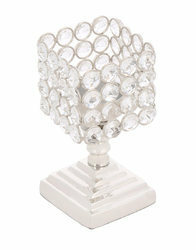 Decorate your room with this crystal bedside lamp creating an ultra-modern style that complements numerous interiors." 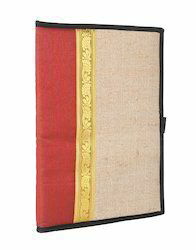 Pen down your notes in this beautiful handmade paper diary designed exclusively. This journal/Paper Diary will give you a smooth writing experience. 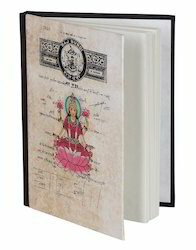 This handmade paper Diary is a craft diary by its design make we brought to you. 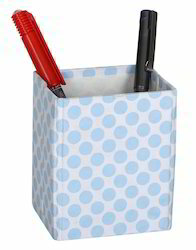 Make your office desk, children's desk and computer table look fantastic with this Handmade Paper Pen stand by Rajrang. This product has been fantastically crafted with classical designing by our skilled craftsmen giving it an eye catching look. The colors here denote the customs and traditions of vibrant and colorful Rajasthan. It offers an array of classic Indian apparel, home decor, furnishings, etc. We hope that you will give us an opportunity to serve you with the products of Rajasthan. Happy shopping..!Tags- pen holder, pen stand for girls, table clock with pen holder, table pen holder, pen stand holder, pen holder with clock, pen stand with card holder, office table pen and key stand, brass made pen stand, pen stand for office. The offered products are excellent examples of the creativity of skilled artisans and are highly acknowledged due to their smooth finish and attractive look. Made using premium quality material. The wooden candle holder act as the elegant showpiece. This beautiful candle holder is on wood. Each item in this range is a perfect reflection of creativity and excellence in wooden work. Exclusively used for gifting purpose in wedding, anniversary and all occasions or for home decoration as a show piece. The beautiful piece that will add a charming touch to any home. With through knowledge of changing trends of the market, we have been able to bring an exotic range of wooden Decorative candle holder. Our offered products are manufactured using high-grade quality wood. 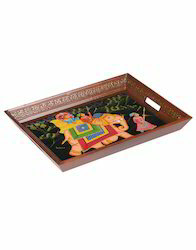 Made using premium quality material, these products have hand painting rangoli work. Each item in this range is a perfect reflection of creativity and excellence in wooden work. Exclusively used for gifting purpose in wedding, anniversary and all occasions or for home decoration as a show piece. The beautiful piece that will add a charming touch to any home. Are you looking for an artful table with a designer look for your home? 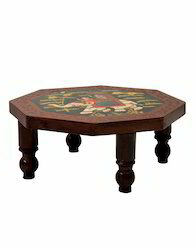 Bring home this Wooden Elephant Printed Table With Hand Painted, and redefine the look of your room. A House Can Instantly Transform To A Home When It Is Beautified With The Right Kind Of Home Decoration Items. Set A Theme For Your Home Decor And Beautify It With Products That Will Perfectly Fit In. A Home Is More Than Just A House, And Decor Is More Than Just Furnishings. Home Decoration Is An Art And Reveals A Lot About The Choice And Preferences Of Individuals. 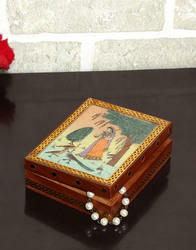 Keep your jewelry and valuables safe in this wooden engraved box from Rajrang.This handcrafted Jewellery Box is made of wood and decorated with gemstone Painting with a Meera painting. The painting is hand made with finely crushed real gemstones which are a royal and traditional art of Rajasthan on a glass base. The gift piece has been prepared by the creative artisans of Jaipur.